Try to get a good photo of a golden-crowned kinglet. Go ahead. Kinglets, both ruby and golden-crowned, generally present themselves as thumb-sized silhouettes, high in the treetops above you. 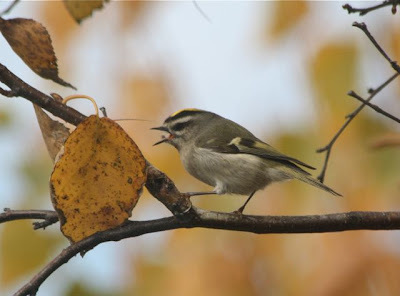 You get a vague impression of something grayish against the sky; you hear some faint tinkling calls and perhaps the beady three-part see-see-see whistle of the golden-crowned, and then they switch trees and you lose them again. Just forget taking a photo of them; they’re too fast and high and nervous. And forget looking down on them, seeing those amazing gold crown stripes. They’re almost never beneath you; they’re high overhead, unattainable. 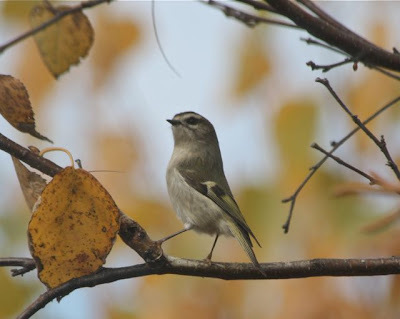 This little female kinglet had been poking around in the arbor vitaes and birches outside the studio window all morning long. I had my Canon Digital Rebel on the drawing table, at the ready. Every time I’d see her, I’d train the lens on her, through the window, through the crop netting screen that protects birds from colliding with my studio portals. And this time, she came out. She had an itch, so she dropped her wing and brought her tiny foot up over it. She scratched her face. I sat in my drafting chair agog, hoping I was getting the photos I was hoping I was getting. She studied a birch leaf and found a tiny insect–spider? Scale? And downed it with a toss of her tiny head. I had a golden-crowned kinglet once who’d hit a window at my Connecticut studio. It had a pretty good concussion. I had a devil of a time force-feeding it with that needle-fine bill and tiny gape, but it made it to fly another day. 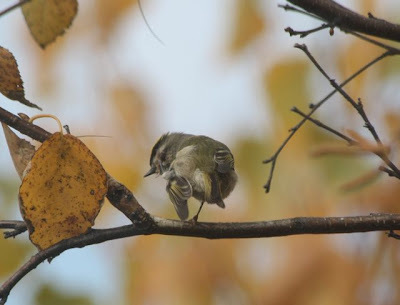 And here was a wild kinglet tossing down a buglet right in front of me. And you can see the bug. And I have a photo of it. All right, I’m satisfied. Satisfied? I’m delirious. Oh, thank you for that view of your crown! If you were a boy, there would be flame-orange down the center. I’ll take you just as you are. 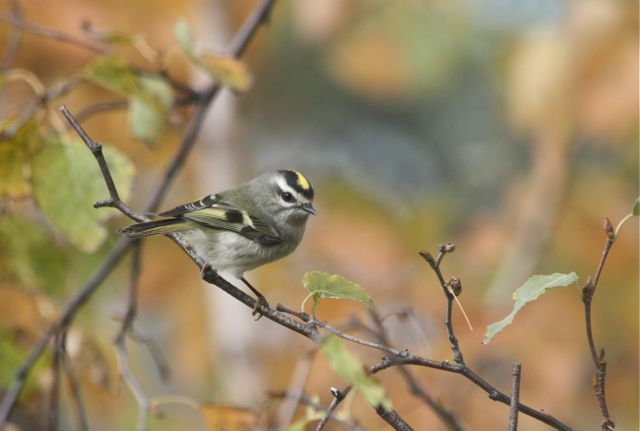 I don’t expect to get much better golden-crowned kinglet photos than these, ever again. **These links go to the product pages on B&H Photo’s web site. If you decide you want to take pictures with my rig and buy a camera or lens from these links, I get a teeny weeny kickback. At least in theory. So if you’ve been thinking about upgrading, I’d be obliged if you’d upgrade from here. You’ll get the lowest price and fastest service. Bloggers: we’re all trying to figure out how to make it pay without looking like craven ravens. The little guys sure are tough. 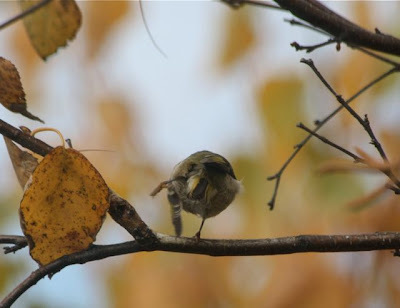 I’ve been trying to get decent photos of NZ Fantails and Grey Warblers for years to no avail. Great photos, Julie. You’re right, these guys are the devil to try to photo. Love the one with the bug. As an aside, kinglets abide by the rule absence of evidence isn’t necessarily evidence of absence, at least when it comes to the crown. 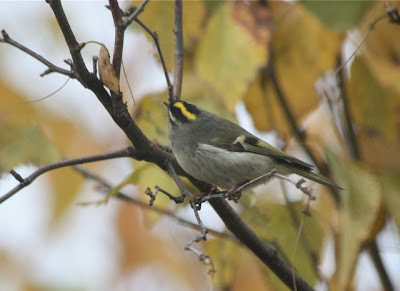 When I used to band these guys (and we’d do several hundred in a season during migration), we’d blow on the crown of each one even if it looked like it lacked the orange/red. Some males can conceal the coloured patch really well (think kingbirds, for a similar example), and there were always a few that the blowing would reveal that what we thought was a female was actually a male. Lovely post and pictures, I know the feeling of that special moment click, click, click, ..
Great captures of this hard-to-pin-down, over-caffeinated little tyke. First prize in the 2010 Witty Blog Entry Title contest. 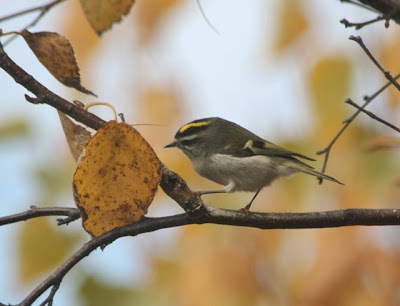 You mean try to draw a kinglet right? This has been a multi-yeared goal of mine. Each year I get a wee bit better. But still they’re next to impossible, even the ones that stay at eye level. Whoa Seabrooke, thanks. Great to know. Next one that comes by, I’ll try to blow on its crown. 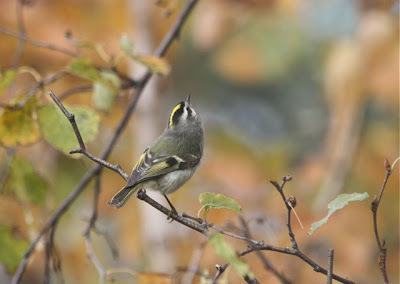 Ken, I just found a bunch of life sketches of the little kinglet I had in rehab. Cages help! Great series of photos Julie! I especially like the last one. Wow! photos of a golden-crowned kinglet and good ones too! That must be one of the toughest birds ever to photograph, though I would add blue-gray gnatcatchers to the really tough list. Super photos! congratulations! Second Biggest Big Year Ever!